Edeniq Inc. has announced the U.S. EPA has approved a cellulosic fuel pathway for Pacific Ethanol Inc.’s Stockton, California, plant using Edeniq’s Pathway Technology, allowing the facility to generate D3 cellulosic renewable identification numbers. The ethanol industry is celebrating the ability of fuel retail stations to again offer E15 to customers for use in all 2001 and newer vehicles beginning Sept. 16. Retailers are currently prohibited from selling E15 from June 1 through Sept. 15. On Sept. 13, the governors of Iowa, Kansas, Minnesota, Missouri, Nebraska, North Dakota and South Dakota sent a letter to EPA Administrator Gina McCarthy asking her to remove the Reid vapor pressure (RVP) limit on E15. Renmatix recently announced a $14 million investment, led by Bill Gates, to support the commercialization of its Plantrose process. 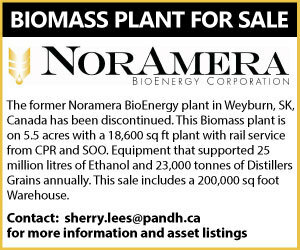 The investment will help drive towards the first wave of Renmatix licensees building Plantrose-enabled biorefineries. The American Petroleum Institute recently spoke out against efforts to move the point of obligation under the renewable fuel standard (RFS). Rather that changes to the point of obligation, the API is calling for repeal or major reform of the RFS. In September, the USDA Commodity Credit Corp. announced it does not expect to purchase and sell sugar under the Feedstock Flexibility Program during fiscal year 2017. The USDA sold surplus sugar to bioenergy producers under the program in 2013. The USDA recently announced $7.4 million in grants will be awarded to 76 small businesses through the Small Business Innovation Research program. The USDA also indicated the SBIR program is currently accepting Phase I grant applications. The Surface Transportation Board has announced the Rail Energy Transportation Advisory Committee will meet on Sept. 22 in Washington, D.C. The meeting is open to the public. On Sept. 12, the USDA released its World Agricultural Supply and Demand Estimates report, lowing its corn production forecast to 15.093 billion bushels, down 61 million from the previous month. Japan recently filed an annual biofuels report with the USDA Foreign Agricultural Service’s Global Agricultural Information Network that highlights the country’s ethanol use and production. Rep. Jim Sensenbrenner, R-Wisc., recently sent a letter to U.S. EPA Administrator Gina McCarthy asking her why the agency has failed to produce reports on the environmental impacts of the renewable fuel standard (RFS). California's Big Oil-disrupting climate-change policies have been extended to 2030, and the state now leads the nation in low carbon fuel retail volumes with more than 14 million gallons of E85 Flex Fuel sold in 2015. Growth Energy joined some of America’s top biofuel champions for a celebration marking the expansion of consumer access to E15. Consumer access to E15 was marked with proclamations in Iowa, Minnesota and North Carolina. Bliss Baker, president of the Global Renewable Fuels Alliance, has reacted to global temperature analyses released by the National Aeronautics and Space Administration that showed 2016 is on track to overtake 2014 and 2015 as the hottest year. Consumer choice at the pump will get a shot in the arm on Sept. 15 as the U.S. EPA’s arcane restriction on summertime E15 sales expires for the year. The end of EPA’s “volatility control season” means many gasoline retailers can again sell E15. Indian Oil Corp. Ltd., India’s flagship national oil company, has selected Praj Industries Ltd., a Pune-based global process solutions leader, as its technology partner for setting up multiple second generation (2G) bioethanol plants. LanzaTech has announced it has produced 1,500 gallons of renewable jet fuel through its partnership with Virgin Atlantic. Since 2011, the partnership has been committed to producing jet fuel derived waste industrial gases via a fermentation process.